You can find all of our latest Electro-Harmonix items and other effects pedals on Our Online Shop here or on display in store. All our effects pedals are available for demo, so you’re welcome to pop in and try anything that catches your eye. Electro-Harmonix are one of our most popular brands of effects pedals at Modern Music. 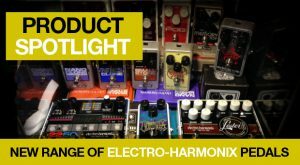 Electro-Harmonix have a huge range of pedals, and we try to keep the most popular pedals in stock. If there’s a particular pedal that you’d like to purchase but can’t see on our Online Shop, just let us know and we can pop it on our next order soon.